As a small-business owner, tax time can be stressful, as you scurry to pull together all of your receipts and try to remember everything you did last year.Although accountants can help you sort and summarize, it’s a lot less expensive if you do that part yourself. Here are the top five things that your accountant really needs to do your taxes. 1. 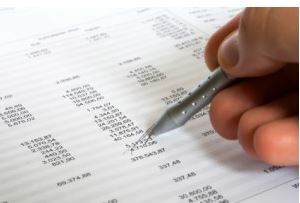 Financial Statements — A basic set of financial documents comprises a balance sheet, an income statement, and a cash-flow statement. For tax purposes, the income statement is the one most used by your accountant, but she will also want to see the company’s assets and liabilities. 2. List of Capital Asset Activity — If you bought, sold, or disposed of any capital assets in the company during the year, you must account for it in your tax return. Your accounting software will allow you to print out a list of all of your capital-asset activity for the year, and this will give your accountant enough detail to classify any changes. If your listing does not specify the exact nature of the assets being bought and sold, make notes in the margin. 3. Vehicle Log — If you sometimes use your own car for business purposes, you can claim a portion of the car’s operating expenses as a tax deduction against your business income. The IRS allows you to calculate this one of two ways: The detailed method starts with adding up all of your vehicle operating expenses (loan interest, lease costs, gas, repairs and maintenance, and insurance). Next, divide the miles driven for business by the total miles driven in the year and apply the resulting percentage to the operating costs. This is your allowable deduction. The simplified method allows you to apply an IRS-mandated mileage rate to the total business miles driven in the year. Under both methods, you are required to keep track of your business mileage in a vehicle log. This can be as simple as jotting dates, descriptions, and miles into a blank notebook. Give this log to your accountant. 4. Summary of Home-Office Expenses — If your home office is your sole place of business, or if you regularly meet clients or customers there, you can generally claim home-office expenses. These include a percentage of your utilities, repairs and maintenance, home insurance, and mortgage interest or rent. You may calculate your home-office deduction by dividing the square footage of your office space by the livable square footage of your house or by dividing the number of rooms your home-office occupies by the total number of rooms in the house. Using either formula, multiply your total home expenses by the home-office percentage. Some accountants will ask you for all of your original receipts and others will only want the summary; be sure to ask which she expects you to provide. Note: Starting with the 2013 tax year, the IRS will allow an alternative simplified method of calculating home office expenses. 5. 1098 Forms for Mortgage Interest and Property Taxes — Your mortgage company likely issued you a Form 1098 at the end of 2012 that summarizes your mortgage-interest and property-tax payments in the year. Your accountant may ask you for this form to claim the mortgage-interest deduction that all homeowners are entitled to, and she will also need them as part of your home-office deduction. If you carry multiple mortgages, be sure to provide 1098 forms for each one. The Top 5 Documents Your Accountant Needs to Do Your Small-Business Taxes | Intuit Small Business Blog. This entry was posted in Budgeting, Information, Tax Time Prep and tagged allowable deduction, assets and liabilities, business mileage, cash flow statement, mileage rate, small business owner. Bookmark the permalink.